Nonbiased V gene usage for V(D)J joining is essential for providing an optimal immune system, but no cis-acting sequence with this function has been uncovered. We previously identified a recombination silencer and heterochromatin targeting element in the Vκ-Jκ intervening sequence of germline Igκ transgenes, which we termed Sis. We now have generated Sis knockout mice in the endogenous locus. 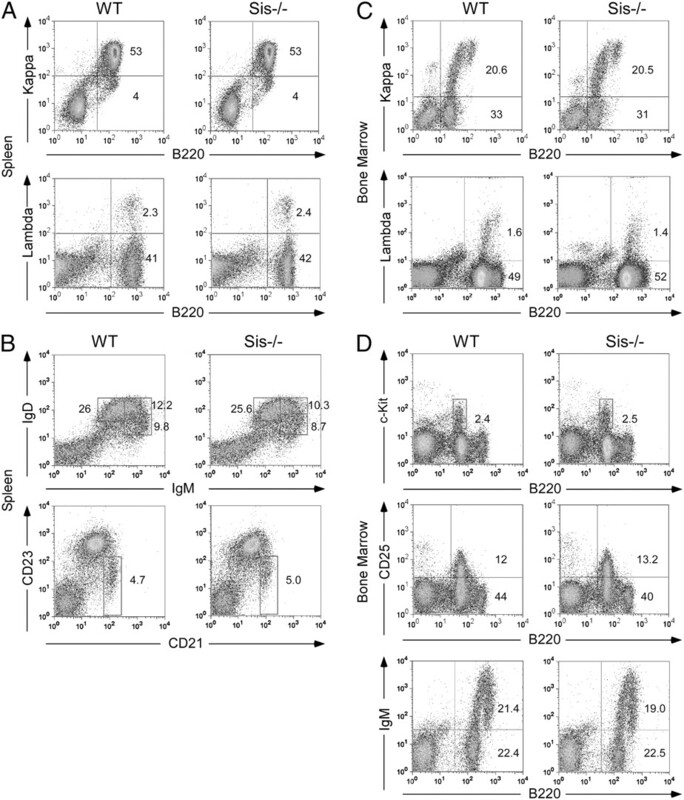 Intriguingly, Sis−/− mice exhibit a skewed Igκ repertoire with markedly decreased distal and enhanced proximal Vκ gene usage for primary rearrangement, which is associated with reduced occupancy of Ikaros and CCCTC-binding factor in the Vκ-Jκ intervening sequence in pre-B cells, proteins believed to be responsible for dampening the recombination of nearby Vκ genes and altering higher-order chromatin looping. Furthermore, monoallelic heterochromatin localization is significantly reduced in Sis−/− mice for Igκ in cis and IgH loci in trans in pre-B cells. Because Sis−/− mice still allelically excluded Igκ and IgH loci and still exhibited IgL isotype exclusion, we concluded that stable localization at pericentromeric heterochromatin is neither necessary nor sufficient for the establishment or maintenance of allelic exclusion. Hence, Sis is a novel multifunctional element that specifies repertoire and heterochromatin localization to Ig genes. During B cell development, the mouse IgH and IgL loci become activated in a step-wise manner for gene rearrangement. The IgH gene rearranges first, by sequential D-J and then by V-(D)J joining, leading to the pro- and pre-B cell stages of development, respectively (1). The Igκ locus is poised for rearrangement in pre-B cells; upon appropriate signaling, one of the 96 potentially functional Vκ genes is semirandomly selected for recombination to a Jκ region (2). These events are accompanied by the sequential monoallelic silencing of the allelic partners of the functionally rearranged IgH and IgL loci (3). A nearly unlimited Ab repertoire is generated in B lymphocytes by the processes of V(D)J recombination, receptor editing, somatic hypermutation, and transcription levels of rearranged genes (4, 5). For the immune system to efficiently recognize a broad spectrum of invading pathogens, this diversity in the repertoire is essential. Furthermore, misregulated or incorrect repertoire specification can trigger autoimmunity (6, 7). Recent evidence emerged that nuclear organization and locus contraction/decontraction of Ig loci contribute to repertoire specification. The mouse Ig loci exhibit cell type and differentiation-dependent nuclear reorganization events, which are associated with the regulation of gene rearrangement and gene silencing (e.g., allelic exclusion) (reviewed in Refs. 3, 8–10). Results from three-dimensional DNA fluorescence in situ hybridization (3D DNA FISH) experiments revealed that the IgH and Igκ loci exhibit homologous allele pairing, accompanied by contraction and looping of V genes, which juxtaposes them near Dh or Jκ regions in preparation for rearrangement (11–16). Furthermore, reduced contraction of IgH loci results in a skewed repertoire, with proximal Vh genes being preferentially used (12, 17–19), whereas persistent contraction results in greater distal Vh gene rearrangements (20). Decontraction occurs after rearrangement (12), and the allelic partners of the functionally rearranged IgH and Igκ alleles become positioned adjacent to pericentromeric heterochromatin and silenced (21), through transient IgH–Igκ monoallelic pairing (20). Several years ago, we discovered a cluster of four DNase I-hypersensitive sites within Igκ-locus-chromatin that reside in the intervening sequence between the closest Vκ gene and the Jκ region, which we termed silencer in the intervening sequence (Sis), based on the results of functional assays with reporter gene constructs (22). In subsequent studies, we showed that Sis acted as a recombination silencer and could target germline Igκ transgenes to pericentromeric heterochromatin in pre-B cells and that the element was associated with Ikaros (23), a protein that localizes with silenced Ig genes at pericentromeric heterochromatin (21, 24–26). More recently, Feeney and coworkers (27) found that Sis also possesses bound CCCTC-binding factor (CTCF) in pre-B cells, a protein known to mediate silencing and DNA looping in other systems (28–32). In view of these intriguing features of Sis, we undertook the present investigation to determine the effects of deleting this element from the endogenous locus on Igκ gene dynamics. In our analysis of Sis function, we focused largely on the pro- and pre-B cell stages of development, which mark the points of activation and silencing of IgH and Igκ loci, respectively. This approach led to unexpected novel findings. Significantly, we found that Sis is required for pericentromeric positioning for the Igκ loci in cis, as well as for the IgH loci in trans in pre-B cells. Furthermore, Sis-deleted alleles exhibited a skewed Igκ repertoire, with markedly decreased distal and enhanced proximal Vκ gene usage for rearrangement. Such skewing correlated with reduction in the occupancy of Ikaros and CTCF in the Vκ-Jκ intervening sequence. We concluded that Sis is a novel multifunctional cis-acting element that specifies repertoire and a cis- and trans-chromosomal subnuclear-targeting sequence. Mice possessing a 3.7-kb deletion of the Sis element in the endogenous Igκ locus were generated by standard embryonic stem (ES) cell-targeting technology; germline-transmissible mice were bred with Cre recombinase-expressing MORE (33) mice to obtain Sis and neor deletion mice (Supplemental Fig. 1). Mice bearing a Vκ8Jκ5 knocked-in Igκ gene were kindly provided by Martin Weigert (34) of Princeton University. Mice bearing a human Cκ knocked-in gene were kindly provided by Michel C. Nussenzweig of Rockefeller University (4). The μ+ transgenic mice and Rag1−/− mice were kindly provided by Mark Schlissel of the University of California, Berkeley. All mice were used in accordance with protocols approved by the University of Texas Southwestern Medical Center Institutional Animal Care and Use Committee. Single-cell suspensions were prepared from bone marrow and spleens of 6–14-wk-old mice, as described (35). Generally, we pooled bone marrow or splenic cells from two or three animals of the same genetic background. Single-cell suspensions were stained with Abs and analyzed using FACSCalibur with CellQuest software (BD Bioscience, San Diego, CA) or FlowJo software (Tree Star, Ashland, OR). CD19+c-Kit+IgM− pro-B cells and CD19+CD25+IgM− pre-B cells were sorted on a MoFlo machine (Dako Cytomation, Carpinteria, CA) for 3D FISH experiments, and B220+IgM−CD43+ pro-B cells and B220+IgM−CD43− pre-B cells were sorted on a MoFlo machine for other experiments. To assay for RS rearrangement, B220+Igλ+ splenic B cells also were sorted on a MoFlo machine. Igκ+ cells were isolated by positive selection using biotinylated anti-Igκ Abs (BD Bioscience) and MACS columns (Miltenyi Biotec, Auburn, CA). The following Abs were used: anti–c-Kit-PE, anti–IgM-biotin, anti–CD43-biotin, anti–B220-biotin, anti-mouse Igκ-biotin, anti–CD21-FITC, anti–CD25-PE, anti–CD19-FITC, anti–B220-PE, anti-mouse Igκ-PE, streptavidin-PECy5 (all from BD Bioscience), anti-human Igκ-FITC, anti–IgM-FITC, anti–IgD-FITC, anti–IgM-allophycocyanin, anti–CD23-allophycocyanin, and streptavidin-allophycocyanin (all from Southern Biotech, Birmingham, AL). Genomic DNA was purified from sorted B cell populations, as described previously (36). The percentage of unrearranged Igκ germline alleles (κGL) was determined by a real-time PCR assay, as described previously (37). Briefly, the forward and reverse primers are complementary to sequences upstream and downstream of Jκ1. κGL levels were normalized to the levels of a β-actin genomic region. The percentage was calculated by dividing the κGL levels in wild-type (WT) or Sis−/− pre-B cells by those in ES cells. For real-time PCR analysis of individual Vκ-Jκ1 rearrangements, forward primers specific to different Vκ exons and a reverse primer complementary to the Jκ1 to Jκ2 intron region were used (primer sequences are listed in Supplemental Table I). Different Vκ-Jκ1 rearrangements were determined quantitatively by using the power SYBR Green PCR Master Mix in the 7300 real-time PCR system (Applied Biosystems, Los Angeles, CA). PCR was performed based on manufacturer’s protocols, and each PCR assay was carried out in duplicate or triplicate. Relative rearrangements were calculated using the ΔCt method, according to the manufacturer’s instructions, and normalized to a β-actin genomic region. For Igκ-repertoire analysis, the VκD primer (38) and a primer in the Jκ1 intron were used to amplify Vκ-Jκ1 rearrangements, or the VκD primer and the Jκ5R primer downstream of Jκ5 were used to amplify Vκ-Jκ5 rearrangements; resulting PCR products were gel purified and subcloned into the PGEM-T vector (Promega, San Luis Obispo, CA). Determined sequences of Vκ genes in each clone were identified by the IgBlast program (National Center for Biotechnology Information, Bethesda, MD). N- and P-nucleotides were determined as described elsewhere (39). To assay for RS rearrangement, B220+Igλ+ B cells were sorted from splenocytes, and genomic DNA was purified. Real-time PCR was performed with the VκD and the RS101 primer (40) (Supplemental Table I). Relative rearrangements were calculated using the ΔCt method, according to the manufacturer’s instructions, and normalized to a β-actin genomic region. To examine Igκ gene germline transcription, total RNA was extracted from 1 × 106 MoFlo-sorted pre-B cells using TRIzol reagent (Invitrogen, Carlsbad, CA). Then, RNA was treated with DNase I (Invitrogen) and was reverse transcribed into cDNA with an iScript cDNA Synthesis Kit (Bio-Rad Laboratories, Richmond, CA). For real-time PCR analysis of individual Vκ gene’s germline transcripts, forward primers specific to different Vκ gene exons and a reverse primer complementary to the downstream RSS region were used (Supplemental Table I). For analysis of transcripts arising from the 5′ germline promoter upstream of the Jκ1 region, a forward 5′GT-f primer annealing immediately downstream of the promoter region and a reverse Cκ-r primer annealing in Cκ exon were used in real-time PCR assays (Supplemental Table I). Transcript levels were calculated using the ΔCt method, according to the manufacturer’s instructions, and normalized to the cDNA levels of the mouse β-actin gene. Probes for 3D FISH were prepared from bacterial artificial chromosomes (BACs). RP23-119K14, RP23-26A6, and RP24-387E13 correspond to the 5′, middle, and Cκ region of the Igκ locus, respectively. CT7-526A21 and RP23-451B13 are BACs corresponding to the 5′ Vh region and Ch region of the IgH locus. The γ-satellite probe was gel isolated from pγSat after NotI/SalI digestion (41). To make probes for each slide, 1 μg BAC DNA samples were labeled by nick translation with ChromaTide Alexa Fluor 488–5-deoxyuridine triphosphate (dUTP), ChromaTide Alexa Fluor 594–5-dUTP (Molecular Probes, Invitrogen, Carlsbad, CA), or dUTP-indodicarbocyanine (Cy5; GE Healthcare, Piscataway, NJ) and precipitated with 1 μg mouse Cot-1 DNA (Invitrogen) plus 1 μg mouse Hybloc DNA (Applied Genetics Laboratories). Cot-1 DNA and mouse hybloc DNA were not used for making the γ-satellite probe. Z stacks with sections separated by 0.3 μm were analyzed by confocal microscopy using a Leica SP5 instrument, and distances were measured using a plug-in of ImageJ software (42). Hybridization conditions were as described previously (24). Briefly, sorted cells were washed three times in PBS, fixed on poly-l-lysine–coated slides for 30 min with fixation permeabilization buffer (20 mM KH2PO4, 130 mM NaCl, 20 mM KCl, 10 mM EGTA, 20 mM MgCl2, 0.1% [v/v] Triton X-100, and 0.5% [v/v] glutaraldehyde [grade 1, 70% aqueous; Sigma Aldrich, St. Louis, MO]), and washed three times in PBS and twice (15 min/wash) with sodium borohydride solution (1 mg/ml prepared freshly in water). The samples were sequentially incubated with PBS with 5% goat serum/5% FCS for 30 min and for 1 h with RNase (100 μg/ml in PBS), washed in PBS, and the chromosomal DNA was denatured by placing the coverslips in 1 M NaOH for 2 min and rinsing immediately in ice-cold PBS prior to applying DNA probes. Hybridization was performed overnight at 37°C in humidified chambers. Slides were washed in the dark in 2× SSC for 30 min at 37°C, 2× SSC for 30 min at room temperature, and 1× SSC for 30 min at room temperature and then were mounted in ProLong Gold (Invitrogen) mixed with 1.5 μg/ml DAPI. To obtain adequate amounts of pre-B cells for Ikaros chromatin immunoprecipitation (ChIP) experiments, which required ∼1 × 108 cells, we bred μ+ transgenic mice with Rag1−/− mice (kindly provided by Mark Schlissel of the University of California, Berkeley) and with Sis−/− mice to establish pre-B cell animal models with the genotypes Rag1−/−, Sis+/+, μ+ transgenic, and Rag1−/−, Sis−/−, μ+ transgenic in the F2 generations (43, 44). Ikaros ChIP was performed, as described elsewhere, using Abs kindly provided by Stephen Smale (University of California, Los Angeles, Los Angeles, CA) (23). For CTCF, H3-Ac, and H3K4me3 ChIP, ∼2 × 106 sorted pre-B (B220+IgM−CD43−) cells or CD19+ pre-B cells from Rag1−/−, μ+ transgenic animal models were used for each ChIP experiment. ChIP experiments were conducted according to the protocol of Millipore. Rabbit anti-CTCF Abs (07-729), rabbit anti–H3-Ac Abs (06-599), and rabbit anti-H3K4me3 Abs (07-473; all from Millipore) were used for ChIP; normal rabbit IgG (Invitrogen) was used as controls. Real-time PCR was performed and quantitated using the 7300 Real Time PCR System (Applied Biosystems) with SYBR Green, as described above, and enrichment of target regions in ChIP was normalized to an α-actin gene sequence (primer sequences are listed in the Supplemental Table I). To examine the function of Sis in the endogenous Igκ locus, we generated germline-transmissible mice with a targeted 3.7-kb deletion of Sis, leaving only a single loxP site in its place, through standard ES cell-targeting technology. Various stages of the targeting and Sis deletion were confirmed by Southern blotting (Supplemental Fig. 1). We found that Sis−/− mice exhibited no significant differences in bone marrow and spleen cell numbers or spleen weight compared with their WT littermates or age-matched WT mice (bone marrow cell numbers [two femurs and two tibias]: 50.7 ± 3.8 versus 49.8 ± 6.3 × 106; n = 9; p = 0.74, Student t test; spleen cell numbers: 126.5 ± 21.8 versus 122.8 ± 19.8 × 106; n = 6; p = 0.77, Student t test; spleen weight: 102 ± 12.4 versus 93.7 ± 15.0 mg; n = 10; p = 0.19, Student t test). Furthermore, Sis−/− mice exhibited similar levels of Igκ+ B cells in spleen compared with WT mice (Fig. 1A, 52.6 ± 2.9% versus 53.3 ± 5.7%, as percentages of Igκ+ B cells among total lymphocytes; n = 6; p = 0.8, Student t test). 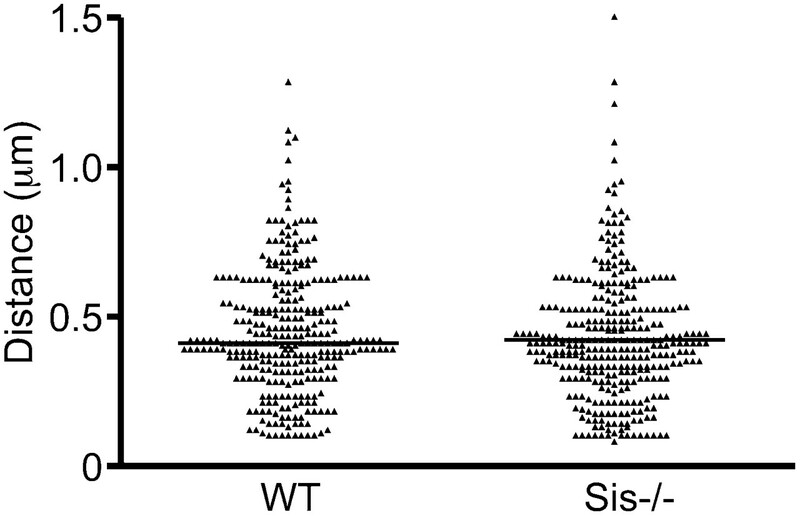 Moreover, the percentages of Igλ+ B cells were nearly identical between Sis−/− and WT mice in spleen (Fig. 1A, 2.4 ± 0.5% versus 2.3 ± 0.4%; n = 6; p = 0.65, Student t test). We further investigated the effect of Sis deletion on the development of B cell subpopulations in spleen by FACS and found that they were all normal relative to those of WT mice, including the percentages of transitional T1 B cells (Fig. 1B, IgMhiIgDlo, 8.7 ± 2.1% versus 9.8 ± 2.4%; n = 6; p = 0.45, Student t test), transitional T2 B cells (Fig. 1B; IgMhiIgDhi, 10.3 ± 1.9% versus 12.2 ± 2.8%; n = 6; p = 0.21, Student t test), follicular mature B cells (Fig. 1B, IgMintIgDhi, 25.6 ± 2.3% versus 26 ± 2.0%; n = 6; p = 0.74, Student t test), or marginal zone B cells (Fig. 1B, CD21+CD23lo, 5.0 ± 1.2% versus 4.7 ± 0.8%; n = 8; p = 0.57, Student t test). Flow cytometric analysis of cell surface Ig expression and B cell development in spleen and bone marrow. A, FACS analysis of cell surface Ig expression in WT and Sis−/− mice. Single-cell suspensions from spleen were simultaneously stained with anti-B220 and anti-Igκ Abs (upper panels) or anti-B220 and anti-Igλ Abs (lower panels). Stained cells were analyzed by FACS. Only cells residing in the lymphocyte gate were analyzed. Percentages of cells residing in various windows are shown in the quadrants. Data are representative of independent FACS analyses from at least six mice of each genotype. B, FACS analysis of transitional, follicular mature, and marginal zone B cells in WT and Sis−/− mice. Single-cell suspensions from spleen were simultaneously stained with anti-IgM and anti-IgD Abs (upper panels) or anti-CD21 and anti-CD23 Abs (lower panels). C, FACS analysis of cell surface Ig expression in bone marrow of WT and Sis−/− mice. Single-cell suspensions from bone marrow were stained and analyzed as described in A. Only cells residing in the lymphocyte gate were analyzed. Data are representative of independent FACS analyses from at least six mice of each genotype. D, FACS analysis of B cell development in bone marrow of WT and Sis−/− mice. Single-cell suspensions from bone marrow were stained with anti-B220 and anti–c-Kit Abs to assay for pro-B cells (upper panels), anti-B220 and anti-CD25 Abs to assay for pre-B cells (middle panels), or anti-B220 and anti-IgM to assay for immature and mature B cells (lower panels). Likewise, the percentages of Igκ+ cells in bone marrow were not significantly different between Sis−/− and WT mice (Fig. 1C, 20.5 ± 1.7% versus 20.6 ± 2.3%; n = 6; p = 0.94, Student t test). We also observed similar levels of Igλ+ cells in bone marrow in Sis−/− mice compared with WT mice (Fig. 1C, 1.4 ± 0.6% versus 1.6 ± 0.6%; n = 8; p = 0.38, Student t test). Finally, we evaluated the pro-B, pre-B, and IgM+ cell compartments in bone marrow from Sis−/− and WT mice by FACS and found no significant differences in the percentages of B220+c-Kit+ pro-B cells (Fig. 1D, 2.5 ± 0.3% versus 2.4 ± 0.3%; n = 9; p = 0.52, Student t test), B220+CD25+ pre-B cells (Fig. 1D, 13.2 ± 3.4% versus 12 ± 2.9%; n = 9; p = 0.44, Student t test), or bone marrow B220+IgM+ B cells (Fig. 1D, 19 ± 5% versus 21.4 ± 2%; n = 7; p = 0.27, Student t test). We concluded that deletion of Sis caused no significant defects in B cell development or in cell surface Ig expression in spleen and bone marrow cells. During the pro- to pre-B cellular transition, Igκ and IgH loci become repositioned monoallelically into pericentromeric heterochromatin; furthermore, this monoallelic deposition of IgH alleles into heterochromatin requires their transient close physical association with Igκ alleles, which is dependent on the Igκ gene’s 3′ enhancer (12, 20, 26). Because our previous studies demonstrated that Sis can specify pericentromeric heterochromatin positioning to germline mouse Igκ transgenes in pre-B cells (23), we wanted to determine whether Sis would be the essential element for this process to occur in the endogenous locus. In addition, we wished to address how deletion of Sis may affect the interchromosomal association between one Igκ allele and one IgH allele and their colocalization to heterochromatin. For these purposes, we performed three-color 3D DNA FISH, using a 5′ Igκ probe shown as red, a 5′ IgH probe depicted as green, and a γ-satellite probe represented as blue, on FACS-isolated pro- and pre-B cells from the bone marrow of WT and Sis−/− mice. Fig. 2A and 2B show representative confocal optical sections of probe-hybridization patterns for single nuclei of these samples. The pair of sections presented from single cells in the upper and lower subpanels permit visualization of the two Igκ and the two IgH alleles and assessment of their possible localization with respect to heterochromatin. Bar graphs reflecting the percentages of heterochromatin localization are shown in Fig. 2C. In pro-B cells, we found that 22–27% of IgH and Igκ alleles exhibited monoallelic heterochromatin localization for WT and Sis−/− samples. By contrast, in pre-B cells of WT mice, ∼58% and 71% of IgH and Igκ alleles exhibited monoallelic heterochromatin localization, respectively, whereas the respective corresponding pre-B cell samples from Sis−/− mice only exhibited ∼27% and 35% monoallelic heterochromatin localization (Fig. 2C). Analysis of these pre-B cell data using the Fisher exact test revealed that the nuclear distributions were significantly different between WT and Sis−/− samples (p < 0.01). In addition, these results were highly reproducible in several repeat experiments (Supplemental Table IIA–C). These observations allowed us to conclude that Sis plays a major role in targeting of Igκ and IgH loci to heterochromatin domains in pre-B cells. We also noted a small, but statistically significant, increase in biallelic localization in heterochromatin of Igκ and IgH loci in Sis−/− pre-B cells that could be judged only when we repeated these experiments three or four times, so that measurements from 276–440 samples could be pooled (p < 0.04) (Supplemental Table IID). Thus, Sis also seems to play a modest role in counteracting biallelic localization in heterochromatin. Previous studies also showed that one IgH allele and one Igκ allele exhibited significant interchromosomal pairing in pre-B cells, which is operationally defined as Igκ alleles that are <0.5 μm away from IgH alleles (20). Because we used three-color 3D DNA FISH, we were also able to quantitate such pairing in these same specimens. As shown in the bar graphs in Fig. 2D, like WT alleles, ∼20% of Sis alleles are <0.5 μm away from IgH alleles in pre-B cells. Analysis of these data using the Fisher exact test revealed that the frequency of association was not significantly different between WT and Sis−/− samples (p < 0.68) (Supplemental Table IIE). We concluded that Sis is a cis- and trans-chromosomal subnuclear-targeting sequence for monoallelic pericentromeric heterochromatin localization of Igκ and IgH alleles in pre-B cells, but that Sis is not required for the monoallelic pairing of Igκ and IgH alleles. Three-color 3D DNA FISH for localization of Igκ, IgH, and γ-satellite sequences in pro- and pre-B cell nuclei from WT and Sis−/− mice. A and B, Representative confocal 0.3-μm-thick optical sections of probe-hybridization patterns in single nuclei of bone marrow-derived pro- and pre-B cells from WT and Sis−/− mice. The two Igκ and two IgH alleles in each cell can be viewed in the separate optical sections shown (upper and lower panels). BAC probes used were complementary to Vh IgH (green) and to Vκ Igκ (red) sequences and a plasmid probe complementary to γ-satellite sequences (blue). Nuclei are outlined by white dashed lines, as identified by DAPI staining, and allele-hybridization patterns are indicated in the left margins. C, Bar graphs representing the percentage of mono- or biallelic localization in pericentromeric heterochromatin domains of IgH (green) and Igκ (red) sequences in pro- and pre-B cells of WT and Sis−/− mice; 100 nuclei were scored for each specimen. Similar results were obtained in several additional independent experiments (Supplemental Table IIA–D). D, Bar graphs representing the percentages of paired IgH-Igκ alleles of various distances (color-coded key) in pro- and pre-B cells of WT and Sis−/− mice; 80 nuclei were scored for each specimen. Similar results were obtained in an additional independent experiment (Supplemental Table IIE). The above results revealed that Sis is responsible in cis and trans for monoallelically targeting the native Igκ and IgH loci to a repressive heterochromatin environment, and our previously published results demonstrated that Sis acts as a recombination silencer when present in germline mouse Igκ transgenes (23). These intriguing observations led us to hypothesize that Sis may specify allelic exclusion and that Sis−/− alleles may exhibit allelic inclusion in cis for Igκ and, possibly, in trans for IgH loci. To test these possibilities in a stepwise manner, we bred Sis−/− mice with mice carrying a human Cκ knockin allele (4); we found, by FACS analysis, that heterozygotes exhibited very similar levels of near-exclusive usage of the mouse or the human Cκ exons, with very few double-positive expressing cells, regardless of the presence or absence of Sis, in splenic and bone marrow tissues (Fig. 3A, 3B). We next evaluated IgL isotype inclusion of Igκ and Igλ loci in WT control and Sis−/− mice splenic B cells by FACS analysis. As shown in Fig. 3C, we observed very few double-isotype+ cells in WT and Sis−/− mice samples. Finally, to test whether IgH loci still exhibited allelic exclusion in Sis−/− mice, we generated IgMa/b, Sis+/+ and IgMa/b, Sis−/− mice after selective breeding of 129/SvTac mice lines with C57BL/6 mice for FACS analysis of IgH allotypic usage. As shown in Fig. 3D, we found very few double-positive IgMa/b producers in the WT control and Sis−/− mice bone marrow cells. We concluded that within the context of the sensitivity of these assays and the combined results, Sis does not interfere significantly with allele usage and is neither necessary nor sufficient to specify allelic exclusion in cis for Igκ or in trans for IgH loci. Analysis of Igκ and IgH allelic exclusion and IgL isotype exclusion. A and B, Analysis of Igκ allelic exclusion. Single-cell suspensions from spleen (A) and bone marrow (B) were simultaneously stained with anti-B220, anti-mouse Igκ (mCκ), anti-human Igκ (hCκ), and anti-IgM Abs. The expression of mCκ and hCκ in Igκm/h and IgκΔsism/h mice splenic (A) or bone marrow (B) B220+IgM+ cells was analyzed by FACS. Percentages of cells residing in various windows are shown in the quadrants. Data are representative of independent FACS analyses from at least six mice of each genotype. C, Analysis of Igκ and Igλ isotype exclusion. Single-cell suspensions from spleen were simultaneously stained with anti-B220, anti-Igκ, and anti-Igλ Abs. The expression of Igκ and Igλ in WT and Sis−/− mice splenic B220+ cells were analyzed by FACS. Data are representative of independent FACS analyses from at least five mice of each genotype. D, Analysis of IgH allelic exclusion. Single-cell suspensions from bone marrow were simultaneously stained with anti-IgMa and anti-IgMb Abs. The expression of IgMa and IgMb cells in bone marrow were analyzed by FACS. Data are representative of independent FACS analyses from at least four mice of each genotype. The mouse Igκ locus possesses 96 potentially functional Vκ genes, and 65 of these genes are in the reverse-transcriptional orientation with respect to the Jκ-Cκ region (2). Rearrangement of forward-orientation Vκ genes will result in deletion of Sis from the WT locus, whereas rearrangement of reverse-orientation Vκ genes from the WT locus will result in repositioning of Sis upstream in the locus by inversion. The closest Vκ gene in the reverse orientation is Vκ19-13, which resides 265 kb from Jκ1, whereas the furthest Vκ gene in the reverse orientation is Vκ9-126, which resides 2780 kb from Jκ1 (2). In addition, repeated rearrangement events occur in the locus due to receptor editing. Primary rearrangement events preferentially use Jκ1 (45, 46), reserving the downstream Jκ regions for receptor editing (4, 34, 40, 47, 48; reviewed in Ref. 49). Considering these issues, we looked more closely at the effect of Sis on the rearrangement of forward- and reverse-orientation Vκ genes Jκ1, as well as for their repeated rearrangement, likely exemplified by Vκ-Jκ5 rearrangements. We previously demonstrated that Sis acts as a silencer for the rearrangement of forward-orientation Vκ genes located ≥190 kb away from Jκ1 when present in ectopically integrated germline mouse Igκ transgenes (23). To investigate whether deletion of Sis would also alter the pattern of primary Vκ gene usage in the native locus, we first used real-time PCR to quantitate relative Vκ-Jκ1 gene rearrangement levels for 14 Vκ genes located in segments of the locus spanning 3 Mb in forward or reverse orientations (Fig. 4A). In IgM− pre-B cells and in κ+ bone marrow and splenic cells, the individual Vκ gene-rearrangement levels differed markedly for Sis-deleted alleles from those of WT (Fig. 4B–D). However, total rearrangement levels for Sis-deleted alleles, as assayed with a degenerate Vκ gene primer (VκD), were similar to those of WT (Fig. 4B–D), as were rearrangement levels for members of the abundant, centrally located reverse-orientation Vκ4 gene family, as assayed for using a degenerate Vκ4D primer (data not shown). Interestingly, the forward-orientation Vκ21 genes closest to the Jκ region were 4-fold preferred for Vκ-Jκ joining, and those further away, such as Vκ2,9,24,32 family members, showed a 3-fold reduction in rearrangement levels relative to those of WT (Fig. 4B–D). The fairly closely positioned reverse-orientation Vκ19-15 gene also exhibited a significant increase in usage in Sis−/− splenic and pre-B cells (Fig. 4B, 4D). Vκ gene repertoire analysis in B cells. A, Relative positions and orientations (arrows) of specific Vκ genes assayed for their rearrangement status in the locus (not to scale). Vκn-specific primers and a primer downstream of Jκ1r were used to assay for specific Vκ-Jκ1 rearrangements in genomic DNA by real-time PCR. Usage of different Vκ genes in κ+ cells from spleen and bone marrow (B, C) and pre-B (D) cells. The percentage usage of Vκ genes in Sis−/− mice was compared with those of WT mice in which the percentage usage was set as 100% (dashed lines). E, The Vκ-Jκ1 rearrangement products of pre-B cells from WT and Sis−/− mice were amplified from genomic DNA by PCR and subcloned into the PGEM-T vector; ∼100 independently determined Vκ gene sequences from each group were identified by IgBlast. The usages of the indicated groups of Vκ gene sequences in WT and Sis−/− cells are shown. F, The Vκ-Jκ5 rearrangement products of pre-B cells from WT and Sis−/− mice were similarly identified as above. To validate these results by an independent approach, we cloned and sequenced VκD-Jκ1 PCR-amplification products from the DNA of WT and Sis−/− pre-B cells. Consistent with the real-time PCR results, we found that the usage of the most proximal 32 Vκ genes was increased ∼3-fold in Sis−/− samples relative to those of WT, including members in forward and reverse orientations in the Vκ13-32 group, whereas the usage of the most distal Vκ118-140 group of forward-orientation genes that was used in WT samples was decreased ∼5-fold in Sis−/− samples (Fig. 4E). Most of the Vκ genes in the middle of the locus in either orientation exhibited normal usage, with the exception the reverse-orientation Vκ49 to Vκ70 gene cluster, which exhibited reduced usage in Sis−/− samples (Fig. 4E). This skewed repertoire was also reflected at the level of RNA expression, because proximal Vκ gene transcripts were increased ∼5–8-fold in splenic tissue from Sis−/− mice relative to those of WT mice, as revealed by real-time RT-PCR assays with isolated RNA samples (data not shown). As expected, the percentages of N- and P-nucleotides and in-frame recombination junctions were nearly identical between WT and Sis−/− pre-B cell samples (data not shown), indicating that Vκ-Jκ recombination products are functional in Sis−/− mice and that the timing of Vκ-Jκ rearrangement was not affected by Sis deletion. In conclusion, although the total Vκ-Jκ rearrangement level was not affected by deletion of Sis, the pattern of primary Vκ gene usage was markedly altered. The results suggested that Sis is a negative regulator of the usage of proximal Vκ genes located at distances ≤650 kb away from Jκ1, regardless of their orientation, and a positive regulator of distal Vκ genes located at distances from 3166–2617 kb away from Jκ1, regardless of their orientation. Finally, to address whether the presence of Sis might have an impact on repeated rearrangements in the locus during receptor editing, we cloned and sequenced VκD-Jκ5 PCR-amplification products from the DNA of WT and Sis−/− pre-B cells. The most dramatic difference between Vκ gene usage in primary and edited rearrangements was the pattern seen in the distal upstream Vκ118-140 group, which included Sis-independent usage of Vκ gene members in both orientations (compare Fig. 4E with Fig. 4F). We hypothesized that these rearrangements to Jκ5 are occurring on WT alleles that have already deleted Sis as a result of earlier deletional rearrangements. Finally, we still observed Sis-dependent inhibition of rearrangements for the Vκ13-32 group for Jκ5 rearrangements, which includes usage of Vκ gene members in both orientations, as well as for the forward-orientation Vκ1-12 group (compare Fig. 4E with Fig. 4F). We interpreted these results to indicate that after inversional primary rearrangements and movement of Sis upstream, at the very least 265 kb away from Jκ1, Sis is inhibitory to the repeated rearrangement process when it is present within ∼650 kb from the Vκ gene selected for rearrangement, regardless of the position of the Vκ gene in the locus. Presumably, primary rearrangement events leading to inversion and placement of Sis upstream in the locus, but still in proximity with the Vκ1-32 gene groups, leads to these results. Our above results revealed that primary Vκ gene usage is skewed in Sis−/− B cells but that overall primary rearrangement levels for Sis-deleted alleles, as assayed with a degenerate Vκ gene primer (VκD) to Jκ1, were similar to those of WT (Fig. 4B–D). We performed additional PCR assays to further address other aspects of primary and edited rearrangement events. We examined the relative usage of Jκ1-5 regions in splenic B cells using a degenerate VκD primer and the Mar35 primer (Fig. 5A–C). We found that each of the four functional Jκ regions was used in Vκ-Jκ joining in Sis−/− mice at equivalent levels compared with those of WT controls (Fig. 5B, 5C). To determine whether total rearrangement levels might be more extensive in Sis−/− mice compared with WT mice, we used a real-time PCR assay to evaluate the germline levels of Igκ sequences in pro-B, pre-B, and κ+ bone marrow and splenic cells from Sis−/− mice and corresponding samples from WT controls (Fig. 5D). We found that the germline levels of Igκ sequences between Sis−/− mice and WT counterparts in each of these samples were almost identical, which indicated that the total Vκ-Jκ rearrangement did not increase after deletion of Sis from the endogenous locus (Fig. 5D). We also confirmed that the percentage of Igκ germline sequences in bone marrow were at the same level as in splenic Igκ+ cells in WT and Sis−/− mice samples using a Southern blotting assay (data not shown). 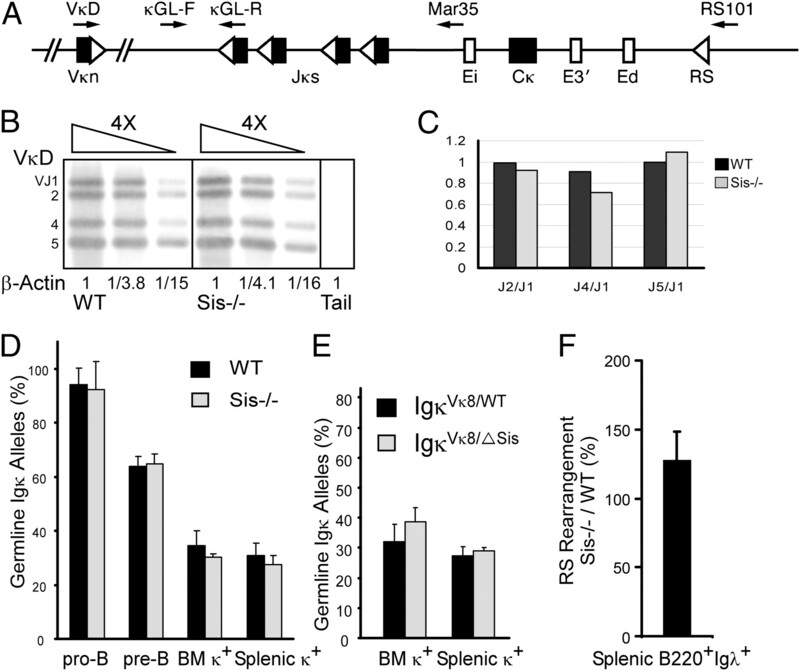 In addition, we observed very similar levels of gene rearrangement between WT and Sis−/− alleles after breeding to achieve heterozygotic genetic backgrounds in which one Igκ allele was prerearranged in the Vκ8-Jκ5 knockin mouse line (34) (Fig. 5E). We also used a real-time PCR assay to evaluate rearrangement to the RS element in λ-producing splenic B cells from WT and Sis−/− mice using the degenerate VκD primer and primer RS101 (Fig. 5A). This assay revealed that Vκ-RS rearrangement was ∼1.2-fold higher in Sis−/− mice samples (Fig. 5F). Finally, we found that Igκ gene rearrangement was undetectable in sorted T cells from WT and Sis−/− mice and, similarly, was very low in sorted pro-B cells (Supplemental Fig. 2). To summarize these results, we concluded that within the context of the sensitivity of these assays and the combined results, Sis does not interfere significantly with allele or Jκ region usage, but it may modestly inhibit Vκ-RS rearrangement, leading to increased editing in Sis−/− B cells, possibly because of the skewed Vκ gene repertoire. Analysis of Jκ usage, Igκ gene germline levels, and RS rearrangement in WT and Sis−/− B cell populations. A, Positions in the Igκ locus (not to scale) of the degenerate VκD primer and other indicated primers used in various PCR assays (arrows). Vκ, Jκ, and Cκ exons are closed rectangles, Ei, E3′, and Ed enhancers are open rectangles, and RSS or RS elements are open triangles. B, VκD and Mar35 primers were used to amplify Vκ-Jκ rearrangements from splenic Igκ+ cells’ genomic DNA. Vκ-Jκ rearrangement PCR products were separated by electrophoresis on agarose gels, and the intensities of Vκ-Jκ1 to Vκ-Jκ5 bands were quantitated by PhosphorImager analysis of Southern blot results. The real-time PCR results of β-actin amplification are shown at the bottom, which were used as genomic DNA-template controls in the PCR reactions. C, The relative usage of the indicated Jκ regions are shown as ratios for WT and Sis−/− Igκ+ cells. D, The κGL-R primer is complementary to the Jκ1 intronic region, and the κGL-F primer is complementary to a region upstream of the Jκ1 RSS sequence that will be deleted after Vκ-Jκ rearrangement. Real-time PCR analysis of the percentage of germline Igκ alleles (κGL) in the indicted B cell populations from WT and Sis−/− mice. κGL levels were normalized to the levels of a β-actin genomic region, and the κGL level in ES cells was set as 100%. Each sample represents tissue pools from two to four mice of the same genotype, and all experiments were repeated at least two independent times. E, Real-time PCR analysis of the percentage of germline Igκ alleles in IgκVκ8/WT and IgκVκ8/ΔSis mice. F, Real-time PCR assay analysis of the levels of RS rearrangement in splenic Igλ+ B cells using the VκD and RS101 primers. RS rearrangement levels were normalized to the levels of a β-actin genomic region, and the RS rearrangement level in WT splenic B220+Igλ+ cells was set as 100%. Data are presented as means ± SD (n = 3). Each sample represents tissue pools from two mice of the same genotype. Previous studies linked several histone posttranslational modifications to the activation of Ig genes in preparation for their undergoing V(D)J joining (reviewed in Refs. 50, 51). Furthermore, two hallmark modifications for locus activation in pre-B cells are acetylation of histone H3 (H3-Ac) and trimethylation of lysine 4 of histone H3 (H3K4me3) in the Jκ region (52). Therefore, to characterize the epigenetic chromosomal state of the Igκ locus in Sis−/− mice pre-B cells relative to WT controls, we performed ChIP experiments with anti–H3-Ac and anti-H3K4me3 Abs and used real-time RT-PCR to quantitate the results. Because Vκ usage was skewed in Sis−/− mice, we also assayed the levels of these histone marks in several Vκ genes in addition to Jκ1. In agreement with previously published results (52), we found strikingly high levels of these modifications in the Jκ1 region in WT mice samples, and although very high, these levels were reduced 2–3-fold in Sis−/− samples (Fig. 6A, 6B). Among the Vκ genes assayed, the most significant enrichments were observed for the far upstream Vκ2-139 gene (Fig. 6A, 6B), which notably showed a 2-fold lower level of the H3K4me3+ epigenetic mark in Sis−/− samples (Fig. 6B); this reduction correlated with the reduced usage of this Vκ gene in primary rearrangement events (Fig. 4B–D). Assay of signatures of chromatin accessibility and silencing in the Igκ locus in pre-B cells from WT and Sis−/− mice. A, Real-time PCR ChIP assays of H3-Ac levels in pre-B cells of WT and Sis−/− mice for specific Vκ genes and the Jκ1 region. Fold enrichment refers to the sequence abundance in the immunoprecipitated sample divided by the corresponding sequence abundance in input DNA relative to a control α-actin gene sequence. Data are presented as means ± SD (n = 3). B, Real-time PCR ChIP assays of H3K4me3 levels in pre-B cells of WT and Sis−/− mice as in A. Data are presented as means ± SD (n = 3). C, The results of real-time PCR assays used to measure Igκ gene germline transcription in pre-B cells initiated from the 5′ promoter (5′GL) and the indicated specific Vκ genes from WT and Sis−/− mice. Data are presented as means ± SD (n = 3). D, Ikaros and CTCF ChIP assays of pre-B cell chromatin from WT and Sis−/− mice. In the upper segment of the schematic diagram, the Sis element is depicted with flanking loxP sites (long arrows) before its deletion by Cre recombinase. PCR primers residing 3′ of Sis, complementary to sequences common between Sis+ and Sis− alleles, are also shown (short arrows). Real-time PCR ChIP assays of Ikaros and CTCF occupancy are shown for WT and Sis−/− samples. Results represent mean ± SD of two independent ChIP experiments. Germline transcription of the Igκ locus in pre-B cells has long been thought to increase locus accessibility to the recombinase apparatus and has been correlated with the process of Vκ-Jκ joining (38, 53). Therefore, we assayed for germline transcripts in pre-B cells from WT and Sis−/− mice, arising from the 5′ germline promoter upstream of Jκ1 (54), as well as for numerous other germline transcripts arising from different specific Vκ genes. As shown in Fig. 6C, we observed a general 1.5–3-fold increase in the steady-state levels of germline transcripts derived from proximal and distal regions in the locus that did not correlate with the patterns observed for Vκ gene usage. This observed overall increase in germline transcription throughout the locus may be a consequence or a cause of reduced pericentromeric heterochromatin localization. These results are consistent with our previously published results, using artificial reporter-gene constructs, that Sis acts as a pre-B cell-specific transcriptional silencer (22). Sis is known to bind Ikaros and CTCF in pre-B cells (23, 27), proteins previously documented to silence sequences near their binding sites (24–26, 28–32). Hence, the preferential rearrangement of proximal Vκ genes in Sis−/− mice might be explained by the hypothesis that these Sis-associated proteins reduce the accessibility of proximal Vκ genes to the recombination machinery. To specifically address the effects of Sis deletion on the recruitment of these proteins, we sheared cross-linked chromatin from pre-B cells of Sis+/+ and Sis−/− mice to fragments 1–2-kb long, so that a 3′ adjacent primer pair could be used to detect sequences common to Sis−/− and WT alleles after ChIP by real-time PCR assays (Fig. 6D, top panel). After immunoprecipitation with anti-Ikaros or anti-CTCF Abs, we found that the assayed sequences in Sis+ alleles were significantly enriched relative to their sequence frequencies in input chromatin DNA samples (Fig. 6D). By contrast, immunoprecipitated samples from Sis alleles exhibited no enrichment in the sequences assayed for over their abundance in total input chromatin (Fig. 6D). We concluded that Sis plays an essential role in cis for the recruitment of Ikaros and CTCF to the Igκ locus V-J intervening sequence in pre-B cells. Previous studies using 3D FISH revealed that at the onset of V(D)J rearrangement of IgH and Igκ loci, the corresponding alleles exhibited contraction and looping (10, 12). Furthermore, when IgH locus contraction is reduced in several genetically engineered mouse models, only proximal Vh genes are favored for rearrangement, which results in a skewed repertoire (12, 17–19). By analogy, we hypothesized that contraction and looping may be reduced in Igκ loci of Sis−/− mice pre-B cells and may account for the preferential usage of proximal Vκ genes. To test this possibility, we performed two-color 3D FISH experiments using Igκ BAC probes corresponding to 5′ and 3′ locations in the locus and quantitated the extent of contraction of the locus in pre-B cell samples from WT and Sis−/− mice. However, as shown in Fig. 7, WT and Sis−/− Igκ alleles exhibited an essentially identical extent of contraction. In addition, when we used three-color 3-D FISH to examine looping in Igκ loci, we also observed very similar images in WT and Sis−/− pre-B cell samples (data not shown). Therefore, we concluded that within the limits of sensitivity of these assays, Sis plays no obvious role in conferring interactions between distal and proximal sequences in the Igκ locus in pre-B cells that contribute to contraction and looping. Two-color 3D FISH for assessment of contraction of the Igκ locus in pre-B cell nuclei from WT and Sis−/− mice. The scatter plots depict pairwise distance measurements between the centers of hybridizing signals from BAC probes at 5′ and 3′ locations in the locus. Data from 311 WT and 323 Sis−/− pre-B cell alleles accumulated from measurements in several independent experiments. Median values are indicated by horizontal lines, which are not significantly different (p > 0.5). Similar results were obtained in several other independent experiments, and no significant differences were noted for WT versus Sis−/− pro-B cells for contraction of the Igκ locus or for IgH locus contraction in similar samples (Supplemental Table IIF, G). In an earlier study, we demonstrated that Sis could target 225-kb germline Igκ transgenes to pericentromeric heterochromatin in pre-B cells (23). In the present investigation, our results revealed that the element is largely responsible for monoallelic targeting of the entire 3.2-Mb endogenous loci to such heterochromatin domains. This deserves special appreciation, considering the fact that Sis only represents ∼0.12% of the total sequences by length in the locus. Even more remarkable, Sis is also largely responsible for targeting IgH loci to such heterochromatin domains. Previous studies showed that IgH and Igκ loci associate at pericentromeric heterochromatin in pre-B cells and that this interchromosomal interaction requires the Igκ 3′ enhancer (20). 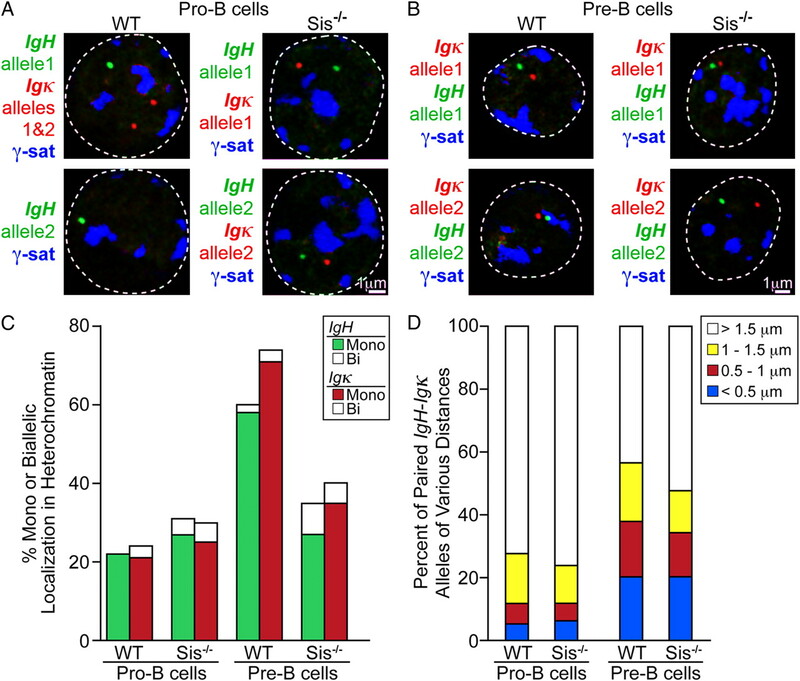 We found that IgH and Igκ loci still interact in pre-B cell nuclei from Sis−/− mice, but like Igκ alleles, IgH alleles no longer become localized to heterochromatin. Therefore, we concluded that Sis is required trans-chromosomally for localization of IgH to pericentromeric heterochromatin by a piggy-back mechanism. In Sis−/− pre-B cells, we observed a significant decrease in the frequency with which IgH and Igκ were positioned at pericentromeric heterochromatin. However, despite their euchromatic location, allelic and isotypic exclusion remained intact. In this context, homologous pairing may be the signal for initiating allelic exclusion in Ig loci (10, 16), just as pairing between maternal and paternal X chromosomes is known to be linked to the process of X-inactivation in developing female cells (42, 55, 56). We already know that RAG-mediated pairing of homologs triggers repositioning of one Igκ allele to pericentromeric heterochromatin and that repositioning of Igκ in pre-B cells normally occurs in an apparently stable manner: ∼70% of cells have one allele repositioned at pericentromeric regions. In contrast, in the absence of RAG, pairing and association of Igκ are significantly reduced. Interestingly, in the absence of Sis, homologous pairing of Ig alleles remained unaffected (Supplemental Table IIH, I), whereas in contrast, association with pericentromeric heterochromatin was significantly reduced. Pairing of Igκ homologs and repositioning of one allele to pericentromeric heterochromatin could still occur, but stable localization is likely antagonized by the elevated levels of Igκ germline transcription that are found in Sis−/− pre-B cells. In this context, transient repositioning of Igκ with pericentromeric heterochromatin is likely to be associated with a transient reduction in accessibility. However, continued homologous pairing and shuttling of alleles backward and forward between euchromatin and heterochromatin could still be sufficient to impose allelic exclusion. Although previous studies identified trans-acting factors that modulate the Igκ gene repertoire (5, 7), Sis is the first example of a cis-acting sequence that is required for repertoire specification. In primary rearrangement events, we observed preferential usage of Jκ-proximal Vκ genes, with severe dampening of distal Vκ gene usage. This skewing of Vκ gene usage seen in B cells is not a result of clonal selection, because similar alterations in repertoire are observed in IgM− pre-B cells in bone marrow. The increase in rearrangement of proximal Vκ genes upon Sis deletion is not a consequence of physically bringing these genes closer to Jκ gene segments. The foreshortening of the 20-kb Vκ-Jκ intervening sequence is small as a result of deletion of the 3.7-kb Sis sequence, whereas Vκ genes even up to 650 kb upstream of this deletion exhibited markedly increased usage in recombination, regardless of their orientation. Sis also seems to play a positive role in the primary rearrangement of the far upstream Vκ genes, whose rearrangement is severely dampened in Sis−/− mice. Because genetically engineered animal models that result in preferential rearrangement of Dh-proximal Vh genes exhibit less contraction and looping in pro-B cells (12, 17–19), we hypothesized that Sis may play a role in Igκ locus contraction and looping in pre-B cells. However, at the limited level of resolution of our 3D FISH experiments, we could find no evidence to support the notion that Sis plays a role in locus contraction or looping. To improve resolution for the detection of alterations in Igκ locus higher-order chromosome structures caused by deletion of Sis, we performed several capturing chromosome-conformation (4C) experiments (57, 58), but we were not able to obtain reproducible results using such techniques, possibly because of the potential dynamic nature of various synapses in the locus in pre-B cells (Y. Xiang and W.T. Garrard, unpublished observations). It was demonstrated in other studies that germline transcription in the Igκ locus is required for Vκ-Jκ joining (53). However, when we assayed for germline transcripts in pre-B cells from Sis−/− mice, we observed a general 1.5–3-fold increase in the steady-state levels of these components derived from proximal and distal regions in the locus that did not correlate with the patterns observed for Vκ gene usage. We also assayed for the epigenetic-positive histone marks that were reported to be heavily enriched in the Jκ region in pre-B cells (52). Although acetylation levels did not correlate with altered Vκ gene usage in Sis−/− mice pre-B cells, we observed a 2-fold reduction in H3K4me3 levels in the far upstream Vκ2 gene, which did correlate with its reduced usage in primary rearrangements. We previously demonstrated that Sis acts as a silencer for the rearrangement of forward-orientation Vκ genes located at distances ≥190 kb away from Jκ1 when present in ectopically integrated germline mouse Igκ transgenes (23). We found that deletion of Sis from such transgenes resulted in a 5–7-fold increase in Vκ gene rearrangement in bone marrow (23). Our current results are extremely consistent with these earlier findings and provide direct evidence for such silencer activity of nearby Vκ genes in the native locus. The silencer activity seems to progressively dissipate the further the Vκ gene is away from Sis and is no longer effective when Vκ genes reach distances >650 kb away from Sis. In addition, we have evidence from Vκ gene usage in presumptive edited rearrangements that the recombination silencing activity of Sis is a function of its distance from the Vκ gene to be used for rearrangement and not the distance of Sis from Jκ1. The primary function of Sis in repertoire specification may be to dampen the recombination frequencies of Vκ genes very close to the Jκ regions, so as to even out the usage of more distal Vκ genes spanning the entire 3-Mb locus, as well as to provide a complementary enhancing effect on distal Vκ gene usage. In conclusion, our results revealed that Sis is a multifunctional cis-acting element, which is involved in subnuclear targeting of germline Ig sequences in cis and in trans, as well as in specification of the repertoire in rearranging alleles. We hypothesize that these functions should be separable, because the element itself possesses four DNase I-hypersensitive sites in chromatin and is associated with at least two DNA-binding proteins. Ikaros is known to have a DNA-binding domain and a protein-interaction domain, and the protein forms homo- and heterodimers with interacting partners through its protein-interaction domain (59). Ikaros is associated with Sis, and it is specifically associated with γ-satellite DNA sequences, which are also localized in pericentromeric heterochromatin (60). Hence, Ikaros homodimer formation between complexes bound to Sis and γ-satellite could be responsible for pericentromeric heterochromatin targeting. CTCF is an insulator-binding protein associated with silencing the activity of adjacent enhancers, and it can play roles in DNA looping and association with cohesin (28–32, 61–65). We propose that the known association of Sis with CTCF and cohesin (27) may be involved in the local silencing of proximal Vκ genes to dampen their usage in recombination, as well as in alterations in higher-order chromatin looping enhancing distal Vκ gene usage in recombination. Site-directed mutagenesis experiments in the future may offer support to these proposals. We thank Stephen Smale of the University of California, Los Angeles for the generous gift of anti-Ikaros antisera and advice on cross-linking; Niall Dillon for the gift of the pγSat plasmid; Jose Cabrera for graphics; and Michel Nussenzeig, Mark Schlissel, Michelle Tallquist, and Martin Weigert for providing mouse lines. This work was supported by Grants GM29935 and AI067906 from the National Institutes of Health and Grant I-0823 from the Robert A. Welch Foundation (all to W.T.G.) and by a Wellcome Trust Project grant and Grant R01GM086852 from the National Institutes of Health (both to J.A.S.).
. 1985. Developmentally controlled and tissue-specific expression of unrearranged VH gene segments. Cell 40: 271–281.
. 2004. Assembly and analysis of the mouse immunoglobulin kappa gene sequence. Immunogenetics 56: 490–505.
. 2010. Allelic exclusion of immunoglobulin genes: models and mechanisms. Immunol. Rev. 237: 22–42.
. 2001. Contribution of receptor editing to the antibody repertoire. Science 291: 1541–1544.
. 2002. OcaB is required for normal transcription and V(D)J recombination of a subset of immunoglobulin κ genes. Cell 110: 575–585.
. 2003. OcaB regulates transitional B cell selection. Int. Immunol. 15: 1099–1104.
. 2006. Rap1 signal controls B cell receptor repertoire and generation of self-reactive B1a cells. Immunity 24: 417–427.
. 2008. Choreography of Ig allelic exclusion. Curr. Opin. Immunol. 20: 308–317.
. 2009. Chromatin architecture and the generation of antigen receptor diversity. Cell 138: 435–448.
. 2010. Chromosome dynamics and the regulation of V(D)J recombination. Immunol. Rev. 237: 43–54.
. 2002. Subnuclear compartmentalization of immunoglobulin loci during lymphocyte development. Science 296: 158–162.
. 2005. Locus ‘decontraction’ and centromeric recruitment contribute to allelic exclusion of the immunoglobulin heavy-chain gene. Nat. Immunol. 6: 31–41.
. 2005. Visualization of looping involving the immunoglobulin heavy-chain locus in developing B cells. [Published erratum appears in 2008 Genes Dev. 22: 1717.] Genes Dev. 19: 322–327.
. 2007. Dynamic changes in accessibility, nuclear positioning, recombination, and transcription at the Ig κ locus. J. Immunol. 179: 5264–5273.
. 2008. The 3D structure of the immunoglobulin heavy-chain locus: implications for long-range genomic interactions. Cell 133: 265–279.
. 2009. RAG-1 and ATM coordinate monoallelic recombination and nuclear positioning of immunoglobulin loci. Nat. Immunol. 10: 655–664.
. 2004. Pax5 induces V-to-DJ rearrangements and locus contraction of the immunoglobulin heavy-chain gene. Genes Dev. 18: 411–422.
. 2007. Yin Yang 1 is a critical regulator of B-cell development. Genes Dev. 21: 1179–1189.
. 2008. Regulation of B cell fate commitment and immunoglobulin heavy-chain gene rearrangements by Ikaros. Nat. Immunol. 9: 927–936.
. 2008. Association between the Igk and Igh immunoglobulin loci mediated by the 3′ Igk enhancer induces ‘decontraction’ of the Igh locus in pre-B cells. Nat. Immunol. 9: 396–404.
. 2001. Nonequivalent nuclear location of immunoglobulin alleles in B lymphocytes. Nat. Immunol. 2: 848–854.
. 2002. Chromatin structural analyses of the mouse Igκ gene locus reveal new hypersensitive sites specifying a transcriptional silencer and enhancer. J. Biol. Chem. 277: 32640–32649.
. 2006. A recombination silencer that specifies heterochromatin positioning and ikaros association in the immunoglobulin κ locus. Immunity 24: 405–415.
. 1997. Association of transcriptionally silent genes with Ikaros complexes at centromeric heterochromatin. Cell 91: 845–854.
. 1999. Dynamic repositioning of genes in the nucleus of lymphocytes preparing for cell division. Mol. Cell 3: 207–217.
. 2005. Epigenetic ontogeny of the Igk locus during B cell development. Nat. Immunol. 6: 198–203.
. 2009. Cutting edge: developmental stage-specific recruitment of cohesin to CTCF sites throughout immunoglobulin loci during B lymphocyte development. J. Immunol. 182: 44–48.
. 2006. CTCF binding at the H19 imprinting control region mediates maternally inherited higher-order chromatin conformation to restrict enhancer access to Igf2. Proc. Natl. Acad. Sci. USA 103: 10684–10689.
. 2006. 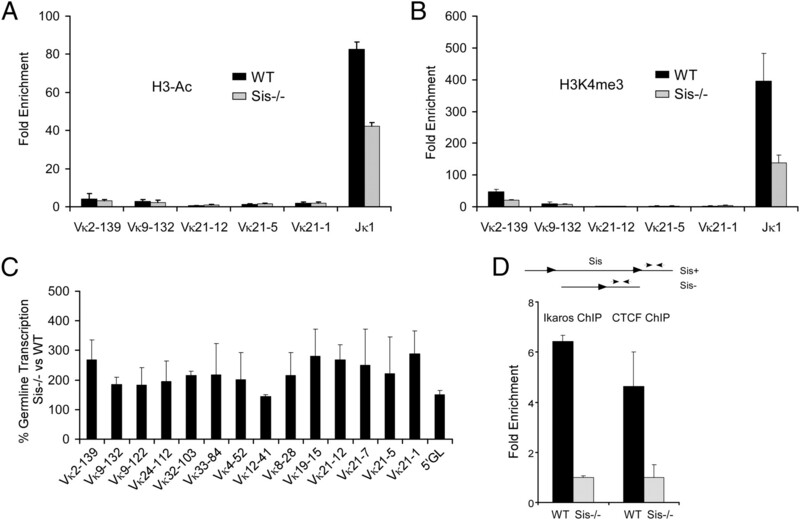 CTCF mediates interchromosomal colocalization between Igf2/H19 and Wsb1/Nf1. Science 312: 269–272.
. 2006. CTCF mediates long-range chromatin looping and local histone modification in the beta-globin locus. Genes Dev. 20: 2349–2354.
. 2007. Analysis of the H19ICR insulator. Mol. Cell. Biol. 27: 3499–3510.
. 2008. The insulator factor CTCF controls MHC class II gene expression and is required for the formation of long-distance chromatin interactions. J. Exp. Med. 205: 785–798.
. 2000. Epiblast-restricted Cre expression in MORE mice: a tool to distinguish embryonic vs. extra-embryonic gene function. Genesis 26: 113–115.
. 1995. Light chain replacement: a new model for antibody gene rearrangement. J. Exp. Med. 182: 541–548.
. 1994. Current Protocols in Immunology. John Wiley & Sons, Inc., New York.
. 2008. The Downstream Transcriptional Enhancer, Ed, positively regulates mouse Ig kappa gene expression and somatic hypermutation. J. Immunol. 180: 6725–6732.
. 2006. Critical roles of the immunoglobulin intronic enhancers in maintaining the sequential rearrangement of IgH and Igk loci. J. Exp. Med. 203: 1721–1732.
. 1989. Activation of immunoglobulin kappa gene rearrangement correlates with induction of germline kappa gene transcription. Cell 58: 1001–1007.
. 2000. High level rearrangement and transcription of yeast artificial chromosome-based mouse Ig kappa transgenes containing distal regions of the contig. J. Immunol. 164: 812–824.
. 1998. Receptor editing occurs frequently during normal B cell development. J. Exp. Med. 188: 1231–1238.
. 2000. Transcription factor dosage affects changes in higher order chromatin structure associated with activation of a heterochromatic gene. Cell 103: 733–743.
. 2007. Sensing X chromosome pairs before X inactivation via a novel X-pairing region of the Xic. Science 318: 1632–1636.
. 1994. Functional immunoglobulin transgenes guide ordered B-cell differentiation in Rag-1-deficient mice. Genes Dev. 8: 1030–1042.
. 1987. Allelic exclusion in transgenic mice that express the membrane form of immunoglobulin μ. Science 236: 816–819.
. 1984. Different joining region J elements of the murine κ immunoglobulin light chain locus are used at markedly different frequencies. Proc. Natl. Acad. Sci. USA 81: 4756–4760.
. 1999. Frequencies of multiple IgL chain gene rearrangements in single normal or kappaL chain-deficient B lineage cells. Immunity 11: 317–327.
. 1993. Receptor editing: an approach by autoreactive B cells to escape tolerance. J. Exp. Med. 177: 999–1008.
. 1993. Receptor editing in self-reactive bone marrow B cells. J. Exp. Med. 177: 1009–1020.
. 2011. Receptor editing as a mechanism of B cell tolerance. J. Immunol. 186: 1301–1302.
. 2009. A histone code for regulating V(D)J recombination. Mol. Cell 34: 639–640.
. 2010. Epigenetic and 3-dimensional regulation of V(D)J rearrangement of immunoglobulin genes. Semin. Immunol. 22: 346–352.
. 2009. The epigenetic profile of Ig genes is dynamically regulated during B cell differentiation and is modulated by pre-B cell receptor signaling. J. Immunol. 182: 1362–1369.
. 1999. A targeted deletion of a region upstream from the Jkappa cluster impairs κ chain rearrangement in cis in mice and in the 103/bcl2 cell line. J. Exp. Med. 189: 1443–1450.
. 2009. Biallelic, ubiquitous transcription from the distal germline Igκ locus promoter during B cell development. Proc. Natl. Acad. Sci. USA 106: 522–527.
. 2006. Transient colocalization of X-inactivation centres accompanies the initiation of X inactivation. Nat. Cell Biol. 8: 293–299.
. 2006. Transient homologous chromosome pairing marks the onset of X inactivation. Science 311: 1149–1152.
. 2006. Circular chromosome conformation capture (4C) uncovers extensive networks of epigenetically regulated intra- and interchromosomal interactions. Nat. Genet. 38: 1341–1347.
. 2008. High-resolution circular chromosome conformation capture assay. Nat. Protoc. 3: 303–313.
. 2000. Targeting of Ikaros to pericentromeric heterochromatin by direct DNA binding. Genes Dev. 14: 2146–2160.
. 2005. Assembly of silent chromatin during thymocyte development. Semin. Immunol. 17: 129–140.
. 2008. Cohesins functionally associate with CTCF on mammalian chromosome arms. Cell 132: 422–433.
. 2008. CTCF physically links cohesin to chromatin. Proc. Natl. Acad. Sci. USA 105: 8309–8314.
. 2008. Cohesins localize with CTCF at the KSHV latency control region and at cellular c-myc and H19/Igf2 insulators. EMBO J. 27: 654–666.
. 2008. Cohesin mediates transcriptional insulation by CCCTC-binding factor. Nature 451: 796–801.
. 2009. Cohesins form chromosomal cis-interactions at the developmentally regulated IFNG locus. Nature 460: 410–413.